I love this stuff but have never made it myself. I have this feeling that I would eat most of it myself. It’s nice that you have a memory attached to it even if it didn’t have a happy ending. Ah, yes. Just like fudge and divinity. Since moving to Houston, I haven’t made either. Some years it’s 75 wtih 90% humidity, and on years when conditions are perfect weather-wise, I haven’t been inclined. Maybe this will be the year! The toffee’s one I’ve never tried, though we’ve done the toffee cookies with saltine crackers as a base. Scrumptious. Oh dear, I’m not sure our Gulf Coast area will help in the making, and it looks so good. Despite the move we’re about 120 miles from Galveston, still not dry enough. My mother laments she hasn’t made divinity since she moved here and I remember her making it when we were young. Maybe this is why Texans are so crazy about their pecan pie…yummy and gooey. That looks delicious! We probably have too much humidity, too. When I was a young girl, at the end of one of my books (don’t remember which one), it had a “recipe” for English Toffee. I talked to my mother about making it, and she took out one of my father’s mother’s candy cookbooks for a real recipe. My grandmother used to make candy and sold a little on the side. Apparently, Butter Crunch was one of the candies she’d make. 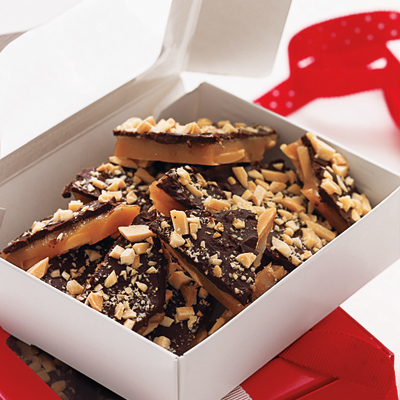 I made the toffee without the chocolate and nuts on top, a number of times. Later in my father’s life, he started to make candies: Butter Crunch and filled chocolates. So, when I saw your picture the first thing that came to me was my father and his Butter Crunch. Good memories. Thank you for sharing this recipe, MJ. I’m going to try to make it if I can find some time between now and Christmas. We love this stuff, and for the past few years, my son’s ex would always bring us a batch at Christmas time. Gotta learn to make my own now!